Ah, Monster Hunter. A franchise I came so close to never getting into. Impressed by the screenshots in the lead up to launch I pre-ordered MH3U for launch day. However, like many newbies to the franchise I was put off by -that- demo. And hence cancelled my order. However, the game’s release led to many 3DS events being held around London in its honour. Many of which I cheekily attended, despite not owning a copy. It was a conversation with a young NintyFan (not David, another NintyFan) about how much I’d liked to see a portable World of Warcraft that led him to explain to me why I was wrong to dismiss the game and about how its qualities constituted that I had been searching for for so long. And, lo and behold, he was right! 300+ gameplay hours in and a frequent attender of the MHCUK meets throughout last year (which are still going by the way, so make sure to check them out) and I can see how wrong I was to cancel my pre-order. I heavily digress. 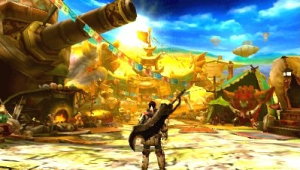 Monster Hunter 4 Ultimate is on its way to the UK in early 2015, and we at 3DSBlessed could hardly be more excited! Therefore we were most pleased at getting the chance to take on a small cross-section of its new roster at EGX14. Available missions were ‘hunts’ (which is the Monster Hunter term for battle, possibly because of what happens to the monster’s remains afterwards!) with a Great Jaggi, the Daimyo Hermitaur and the rather extreme Tigerstripe Zamtris! I was fortunate enough to be Player 1 in the team I sat with, and hence the person who got to decide which monster the team took on. Seeing as my time spent playing MH3U saw me fighting enough Great Jaggis to last me a lifetime I opted for the latter two. The Daimyo Hermitaur and Tigerstripe Zamtrios were both intriguing amalgamations of real-world non-human animals (which is something the franchise is well known for) In true Monster Hunter style both exhibited surprising (yet logical in their context) moves. These were sometimes humorous (such as the Daimyo Hermitaur’s Water Blast) and often devastating. Like MH3U ; this game’s visuals are a joy to behold! As is probably obvious I’m now a pretty massive fan of MH3U. And, as such, believed it couldn’t be bettered. Heck, its still the best looking game available in the UK right now in my humble opinion. But MH4U does elevate the experience. It has better frame rate and is more responsive. 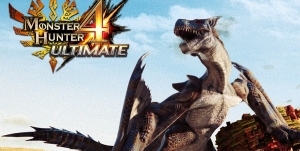 In addition ; if the level of creativity exhibited in the EGX14 demo is consistent across the game, MH4U is shaping up to be quite a unique 3DS title indeed! I’m disappointed that the game will feature Zelda and Metroid costumes, with a Sonic outfit available for your Felyne pet. MH3U didn’t have to resort to this kind of thing, and was all the better for it. I am of the opinion that gratuitously amalgamating incompatible franchises only serves to cheapen each one concerned. In the game’s defence its been suggested to me that these are probably just optional DLC additions. So those of us who wish to and who mainly play offline can happily pretend they do not exist! In conclusion Monster Hunter 4 Ultimate will no doubt be the best game on the 3DS. Yes the franchise tie-ins are annoying, but I cannot deny that they will atleast bring in more hunters to the franchise. Which is something every Monster Hunter fan wants to see. 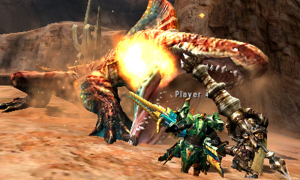 This game will also feature online hunts, something 3DS MH3U fans have literally been aching for for nearly 2 years.